OnePlus 5T Android mobile launched with Dual rear camera and 6.01-inch Optic AMOLED capacitive touchscreen (1080x2160 pixels) display. 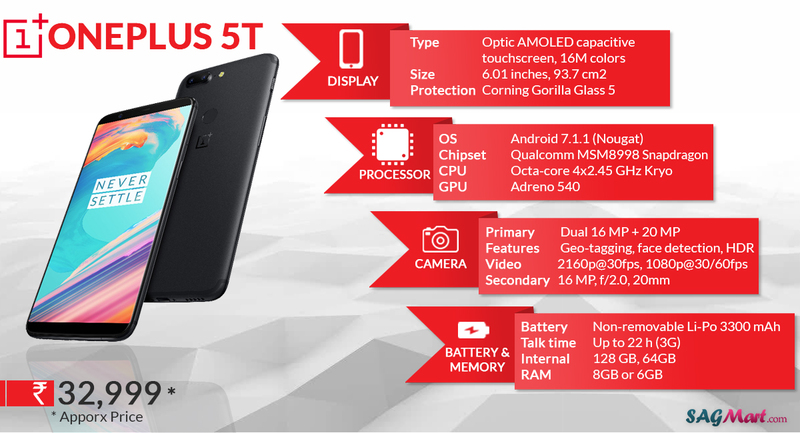 The smartphone has been powered by a Octa-core (4x2.45 GHz Kryo & 4x1.9 GHz Kryo) processor with 6/8GB of RAM. The Dual SIM device operates on the Android 7.1.1 Nougat Operating Systems and 64/128GB inbuilt memory, nonexpendable memory. The connectivity options included are 4G VoLTE, 3G, Bluetooth v5.0, USB Type-C, NFC, Wi-Fi 802.11 a/b/g/n/ac. It is embedded with 3300mAh Non-removable Li-Po Battery and the 16+20-megapixel Dual primary sensor coupled with 16-megapixel front camera. The OnePlus 5T comes with a 6-inch AMOLED display with a resolution of 2160 x 1080 pixels. It has a pixel density of 402 PPI. The device has equipped a Corning Gorilla Glass 5 to protect the screen from scratches and minor knocks. In terms of design, The phone packs a metal unibody & ships in midnight black color. Top sensors on the device include an accelerometer, proximity, magnetometer, ambient light sensor & gyroscope. The firm has made an advance to the camera system on OnePlus 5T. The OnePlus 5T packs a dual rear camera setup, each having a 16MP lens. Both come with f/1.7 aperture & are accompanied by dual LED flash that can take better low light photos than the OnePlus 5. As for storage, The flagship smartphone comes with a large amount of data as it is equipped with a humongous 64/128 GB inbuilt internal storage without card slot support for storage expansion. OnePlus 5T offers a 3300mAh li-polymer non-removable battery. It offers firm’s dash charging 2.0 technology. It supports dual SIM (GSM and GSM) for nano sim cards. The Connectivity options on the phone include 4G LTE, 3G, 2G, WiFi, Bluetooth, NFC and a USB type-C slot. The top sensors on the device include Fingerprint (rear-mounted), Accelerometer, Gyro, Proximity, Compass. Oneplus 5T is an overall performance topper smartphone, but still, there are other smartphones which can give head to head competition to it. Below are the comparisons and detailed review of the Oneplus 5T with other smartphones.